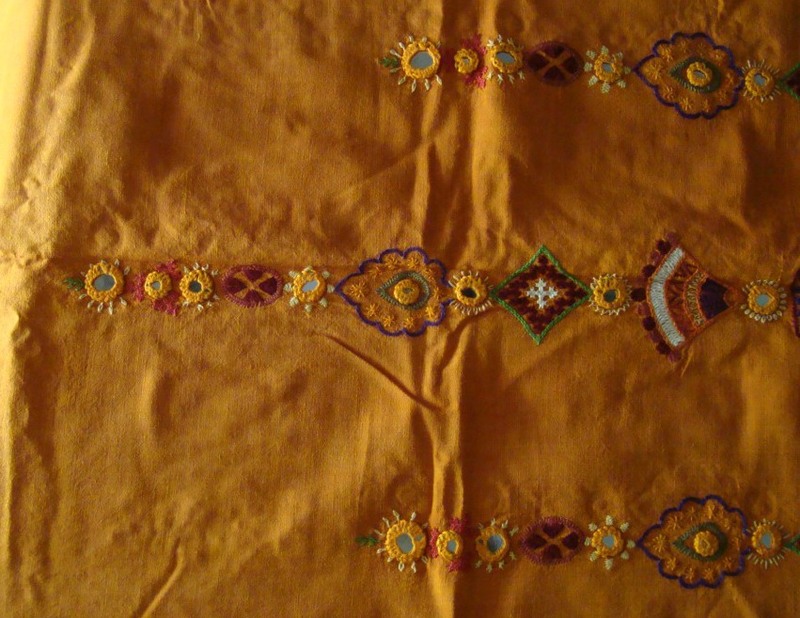 The different motifs in this tunic were all detailed on my previous posts.generally these motifs are used in bags, wall hangings,cushions, yokes,etc. I wanted to use it this way because, the tunic otherwise looked quite dull, and I thought, with this background fabric colour, various colour combinations can be experimented. Now for the whole tunic, as I mentioned earlier, it was hard to take the whole picture with clarity, so I have taken it in three parts. The tunic in its full glory! Though I had drawn the motifs in a straight line on the paper, it was quite a feat to copy it on the fabric.I could have managed with a single line ,more than one was very difficult, the lines on the side took lots of effort, but once the pattern was drawn on the cloth, the embroidery was just repeating every motif thrice.I really enjoyed working on these motifs. 1. the stitch around the mirror is an variation of herringbone and Cretan, this is the stitch with which the mirrors are stitched on to the fabric. 2 I adopted this motif from a book and modified to my requirement.the stitches worked are- herringbone, chain, fly ,stem ,french knot,and mirror. 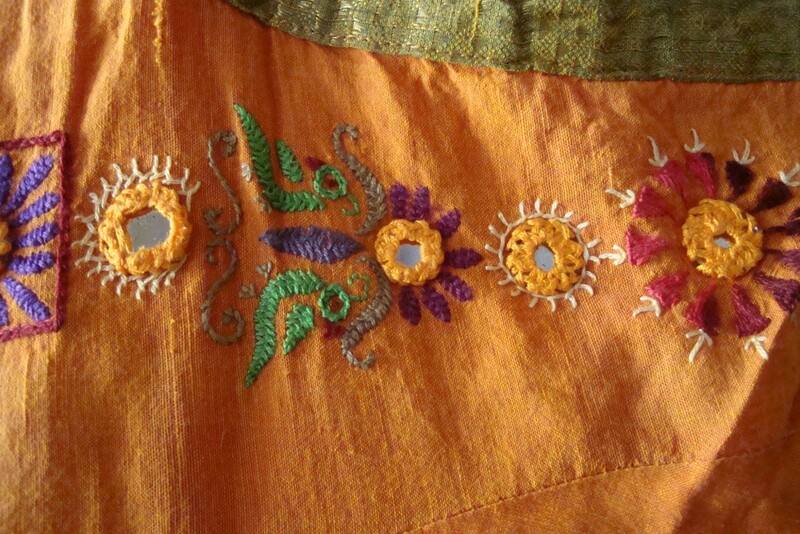 3. the mirror here is embellished with buttonhole stitch. 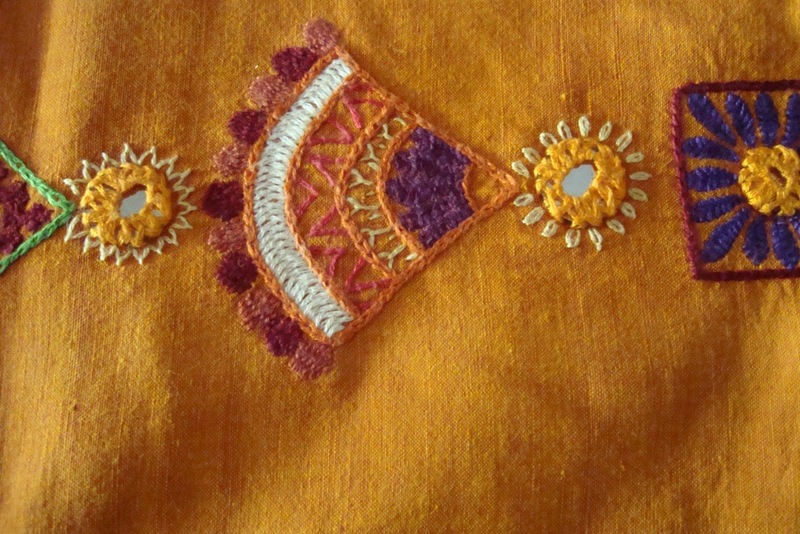 4. small triangles were drawn around the mirror and are worked in Cretan stitch filling with variegated thread. Detached fly stitch are worked around the motif. The different motifs are detailed in these posts. More pictures of this tunic on my next post. 1. Detached fly stitches are worked going around the mirror. 2.various stitches are worked in this cone shaped design. I had done this cone pattern in another tunic, I became quite fond of the shape, so this was repeated in this tunic motif too. The details-a line of Cretan stitch worked in circles, herringbone stitch worked in cream[ looks like white], I think the next line is arrowhead stitch[ may be it is couched down, I don’t remember now],This line the long tailed fly stitches are worked with small straight stitches, the petals are worked in herringbone stitch, finally,the outlines are worked in chain stitch. This completes this motif. 3. 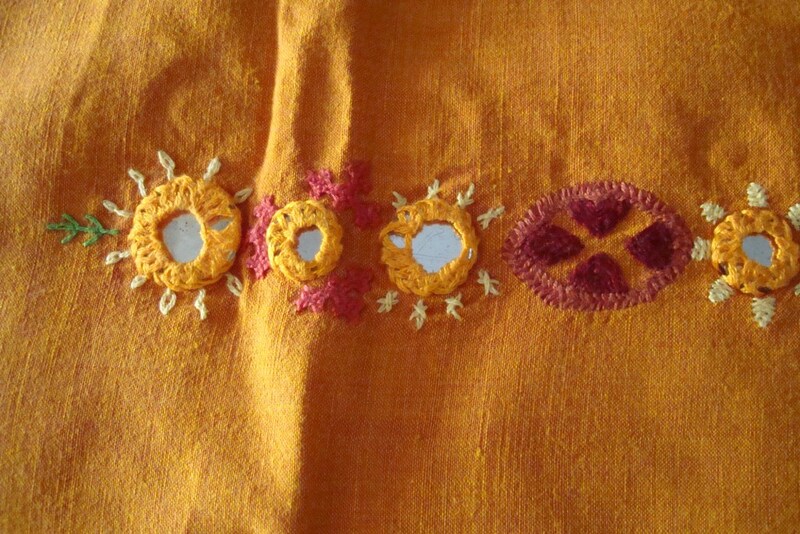 Detached chain stitches are worked around the mirror. 4.Mirror is the centre of this square motif with herringbone petals and chain stitch outline. The last set of motifs on my next post. I want to explore various options with existing embroidery. This working with different motifs gave me a wonderful opportunity to do so. Though I had completed the embroidery, some time ago, the pictures were taken only this year. 1.the mirror is outlined with herringbone stitch filling, a variation double cross stitch or Rhodes stitch are worked around the herringbone stitch, a scalloped line of chain stitch is worked around these stitches . 2. a mirror with long and short straight stitch detail. more details on my next post. A few years back, I had this sewn tunic sitting with me. 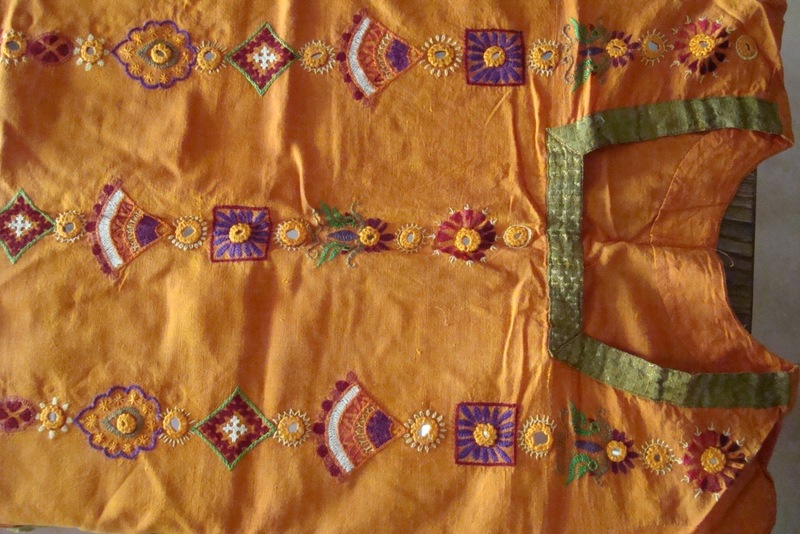 The tunic was light orange mangalagiri cotton with green border, the salwar was in the same green colour as the border. It looked too simple and dull to be worn as it was. 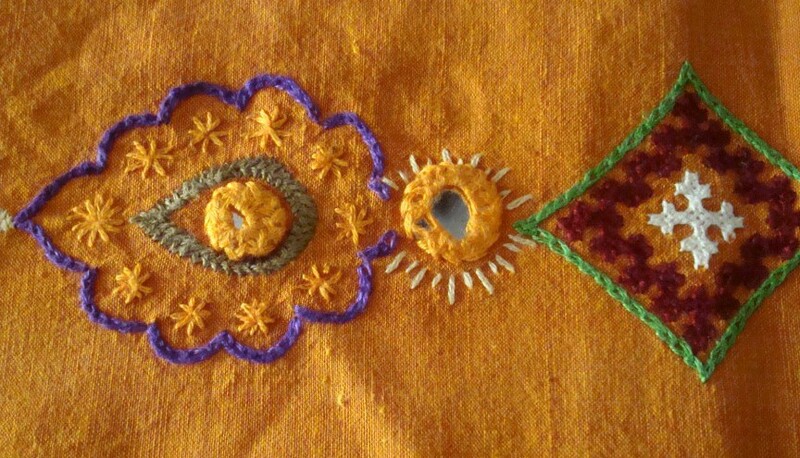 Then an idea came, to work different ethnic[Indian] motifs in bright colours. Choosing the colours by itself was a challenge. The motifs were chosen from different places, I don’t remember now. some motifs I modified to suit my purpose. 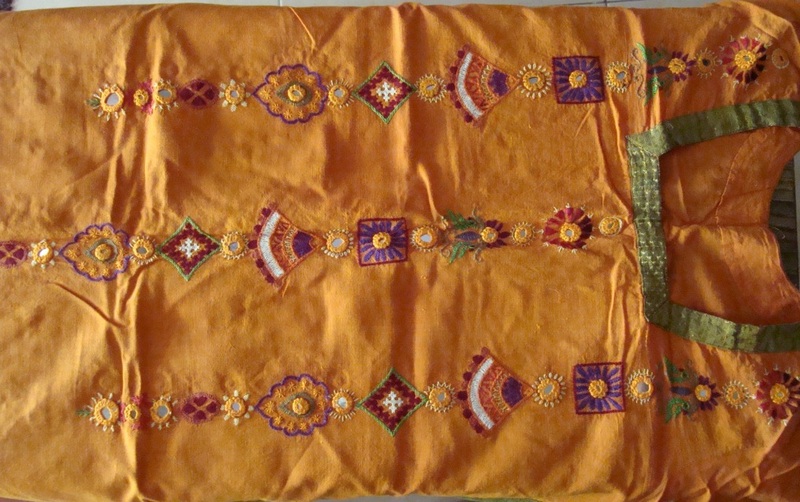 All these motifs were then organized to make a long border pattern[ that it looked like a thoran was a different story !] but nothing could deter me, I proceeded with my idea. Which grew so much , that I wanted to this same border three times on the tunic. Different stitches were used – chain, straight, herringbone, back, to name a few. 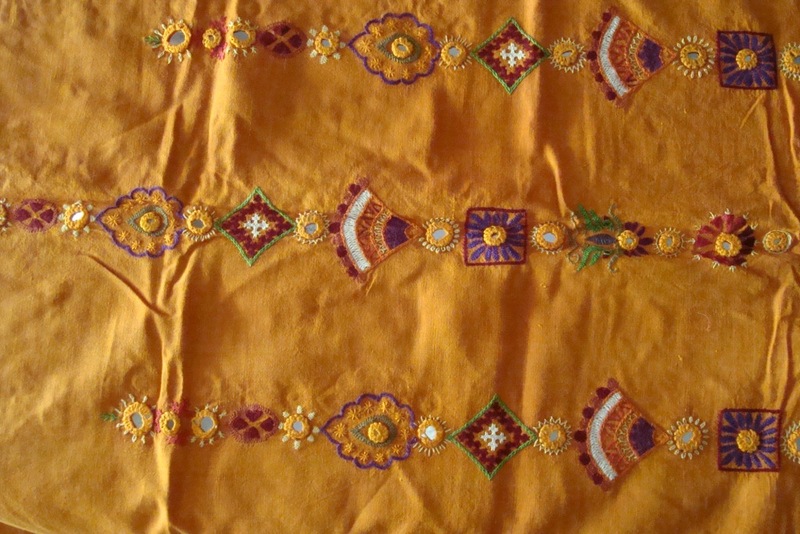 Kutch motifs were also worked in between. Mirrors were added too for this long border. I did not have any plans of the decorative details at the pattern drawing stage. I improvised on the patterns with details, while I worked the embroidery. It also helped when I had to work each and every detail three times. I started with one motif, worked it thrice, and moved on to the next one. the decorative details of the mirrors were worked first, and then the mirrors were attached to the fabric. 1. First mirror with detached chain detail.